Multi-published author T. Greenwood’s newest novel, Grace, opens with twelve-year-old Trevor Kennedy trudging through the field behind his house in the midst of a blinding snowstorm. His father Kurt pushes him along, Kurt’s rifle aimed at the back of Trevor’s head. What could push a loving father to such madness? The suspense of that question alone could hold a reader’s attention. But add to that a fascinating story of what led up to that snowy day, impeccably written with lovely narrative, and you have a book that is difficult to put down. Trevor hates school. He’s shy and quiet, and confused by his body’s physical changes. He is harassed mercilessly by two school bullies. When he does try to defend himself, he gets suspended by the school principal. The one bright spot in Trevor’s life is art class and his art teacher, Mrs. D, his only friend. Trevor’s life changes the day Mrs. D gives him a 35 mm camera. Kurt owns a scrap yard and struggles to provide for his family, even taking on a second job at a convenience store in an attempt to please his needy unfulfilled wife Elsbeth. He also feels responsible for his aging father Jude, a difficult, chronic hoarder. Elsbeth cuts and styles hair at a local salon. She adores her daughter, Grace, but finds it difficult to relate to Trevor. She became pregnant with Trevor at the age of seventeen when she and Kurt were dating, and spends most of her days dreaming of what might have been. She tries to fill the void in her life by compulsively shoplifting trinkets and baubles from Walgreens. In a parallel storyline, Crystal, a high school senior who works part-time at Walgreens, has recently given up her newborn infant for adoption. Her long-time boyfriend Ty wanted nothing to do with her or the baby and, heartbroken, Crystal felt coerced by her family to give the baby up. Every character, save Grace, feels trapped in their life circumstances and dreams of a way out. Young Gracie is the glue that holds all the loose threads together. Everyone loves her. She is beautiful and precious and perfect. When they feel they can’t go on another day, they look at Grace and feel a reason to live. But what happens when a bomb has exploded at the school and Grace is missing? As a fierce winter storm brews in the bleak Vermont sky, the storylines cross and collide in a catastrophic climax. 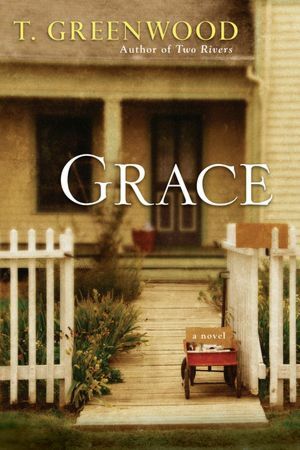 Grace is T. Greenwood’s sixth novel and was released in March 2012. Visit the author’s website at tgreenwood.com.